When a team is firing on all cylinders, they produce great work. But when a team doesn’t work well together, it can mean projects don’t get done correctly, deadlines are missed and bosses or shareholders aren’t happy. Research shows that group team building can positively affect outcomes across the board. When you are looking for group activities in Reno to help increase the bond between your team, take into account some of the following factors that can help improve your team chemistry. Spend time learning what your team members need :– One of the biggest mistakes made when it comes to group events in Reno, and anywhere for that matter, is that the activities don’t focus on the needs of the team. When you take the time to learn what your team needs in order to be successful, you can create a group building exercise or activity that focuses on those things. In order to achieve this, you may want to consider giving employees a questionnaire or survey that asks them what they feel they need in order to enhance their efforts at work. If you have a large team, you could even form a committee that comes together and comes up with a group team building event or activities that your team would enjoy. Holding fun and stimulating team building days quarterly or annually can help boost morale as well and give the team something to look forward to. Develop a common vision and goals:– Being on the same page is important when it comes to working with a team. When you work on building a vision for how you want the team to perform and function as a unit, the team as a whole will work more efficiently. Employees need to have a clear understanding of their roles and how they contribute to the overall success of the business. When you create an environment where group team building is a priority, teams actually want to work together to achieve the goals that they set out to achieve. They see the bigger picture and they are going to work and function more cohesively than a team that is disjointed. Spending a small amount of time discussing these things with your team will bring your team closer together. Take the bonding event out of the office and HAVE FUN:– Everything is more fun and relaxed when you get a group of employees together outside of the work place. Coming up with a fun activity that your team will enjoy can be a lot of pressure. But you will definitely earn their favor if you take the group event out of the office. Environment is everything, and making sure that you pick a place that will facilitate the group activities in Reno that will yield the most fun for your employees matters. 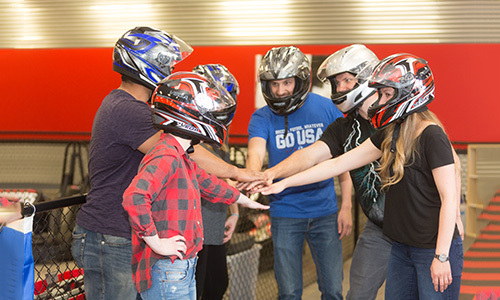 Need 2 Speed is the Ultimate Group Team Building Destination:- When it comes to group activities in Reno, there is one place that has a great track record of providing a fun environment for all of your group team building needs. By stimulating healthy competition between your employees, you can continue to build the bonds that we know are so important for your team to be successful. If you’re planning a group event in Reno, our team here at Need 2 Speed has your team covered. Call us today at (775) 851-7223 to schedule your next group team building event in Reno and give your employees the bonding experience they have been waiting for.